The S&P 500 (^GSPC) bottomed on March 9, 2009, which marked the start of the longest bull market on record. With the tenth anniversary of the bull market around the corner, DWS strategist David Bianco looked at how the bull market has managed to last as long as it has. “The last two business cycles in the United States and many other advanced economies have been unusually long,” Bianco wrote in a note earlier this month. 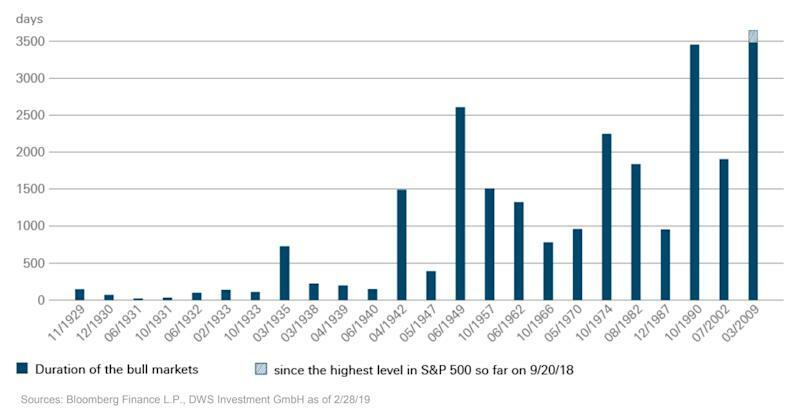 It has been long, but investors who have been riding this bull market have reaped some impressive returns during that time. The S&P 500 has rallied by more than 300%. History of bull markets (Bloomberg Financial/DWS Investment). Bianco compared this bull market to previous cycles in history to gauge how it stacked up. It found that in the 1930s, the average bull market lasted about half a year, while following World War II, they lasted about 4 years. After 1990, bull markets spanned eight years or longer. According to Bianco, one of the reasons for longer bull market cycles might be due to some structural causes. “More efficient management of inventories, or the shift from manufacturing to services come to mind as possible causes,” Bianco said. Additionally, “another factor might have contributed, too: After the crash of 1987, markets have been increasingly banking on monetary policy to come to the rescue, if something threatens to go wrong,” he added. It is widely referred to as the “Fed Put.” That term describes when the Federal Reserve intervenes and uses the central bank’s ability to lower short-term interest rates to give the stock market a chance to recover after a crisis. As the bull market cycle stretches on, Bianco reminded market watchers that bear markets typically signal a recession ahead and usually catch investors and economists by surprise. Recent economic data hasn’t been all that encouraging. While fourth-quarter GDP for 2018 grew 2.6% and was better than expected, it still showed that the U.S. economy is cooling down. While economists aren’t quite ringing the alarm about a recession this year, some are predicting that the economy could potentially see one on the horizon as an influx of economic data points to a weakening economy and global growth slows. NOTE: A version of this story was published on March 1, 2019.